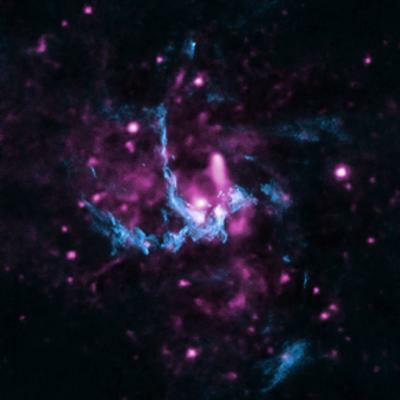 Astronomers have long sought strong evidence that Sagittarius A* (Sgr A*), the supermassive black hole at the center of the Milky Way, is producing a jet of high-energy particles. Finally they have found it, in new results from NASA's Chandra X-ray Observatory and the National Science Foundation's Very Large Array (VLA) radio telescope. Previous studies, using a variety of telescopes, suggested there was a jet, but these reports -- including the orientation of the suspected jets -- often contradicted each other and were not considered definitive. "For decades astronomers have looked for a jet associated with the Milky Way's black hole. Our new observations make the strongest case yet for such a jet," said Zhiyuan Li of Nanjing University in China, lead author of a study appearing in an upcoming edition of The Astrophysical Journal and available online now. Jets of high-energy particles are found throughout the universe, on large and small scales. They are produced by young stars and by black holes a thousand times larger than the Milky Way's black hole. They play important roles in transporting energy away from the central object and, on a galactic scale, in regulating the rate of formation of new stars. "We were very eager to find a jet from Sgr A* because it tells us the direction of the black hole's spin axis. This gives us important clues about the growth history of the black hole," said Mark Morris of the University of California at Los Angeles, a co-author of the study. The jet appears to be running into gas near Sgr A*, producing X-rays detected by Chandra and radio emission observed by the VLA. The two key pieces of evidence for the jet are a straight line of X-ray emitting gas that points toward Sgr A* and a shock front -- similar to a sonic boom -- seen in radio data, where the jet appears to be striking the gas. Additionally, the energy signature, or spectrum, in X-rays of Sgr A* resembles that of jets coming from supermassive black holes in other galaxies. Scientists think jets are produced when some material falling toward the black hole is redirected outward. Since Sgr A* is presently known to be consuming very little material, it is not surprising that the jet appears weak. A jet in the opposite direction is not seen, possibly because of gas or dust blocking the line of sight from Earth or a lack of material to fuel the jet. The region around Sgr A* is faint, which means the black hole has been quiet in the past few hundred years. However, a separate Chandra study announced last month shows that it was at least a million times brighter before then. "We know this giant black hole has been much more active at consuming material in the past. When it stirs again, the jet may brighten dramatically," said co-author Frederick K. Baganoff of the Massachusetts Institute of Technology in Cambridge, Mass. Astronomers have suggested the giant bubbles of high-energy particles extending out from the Milky Way and detected by NASA's Fermi Gamma Ray Telescope in 2008 are caused by jets from Sgr A* that are aligned with the rotation axis of the galaxy. The latest results from Chandra support this explanation. The supermassive black hole at the center of the Milky Way is about four million times more massive than our Sun and lies about 26,000 light-years from Earth. The Chandra observations in this study were taken between September 1999 and March 2011, with a total exposure of about 17 days.